A 20%-protein, water-resistant pelleted ration designed to enhance the deer’s natural forage diet. The high protein content supports top performance with AntlerMax Technology to promote superior antler growth in bucks, reproductive success and abundant milk production in does, and supports optimum growth and healthy development in fawns. Protected by exclusive Water Shield Technology which makes the pellet resistant to moisture, reducing waste and labor associated with water damage. ANTLERMAX® PELLETS - For the development of optimal antler size and mass. Provides for a high intake of high-quality proteins including AntlerMax® By-Pass Protein technology that deliver high concentrations of amino acids needed by the growing antler. Helps develop deer with exceptional body size. High-quality protein helps maintain muscle to support body growth. OPTIMUM LEVELS OF VITAMINS AND MINERALS - Helps promote antler growth, density and strength. Optimum levels of calcium, phosphorous, magnesium and vitamin D. Contains proprietary AntlerMax® Mineral Technology including organic trace minerals for replenishing depleted bone material stores used during antler mineralization. DESIGNED TO REDUCE PELLET WASTE AND LABOR ASSOCIATED WITH WET CONDITIONS - Water-resistance process that repels moisture. The result is increased savings because of the dramatic reduction in pellet waste. 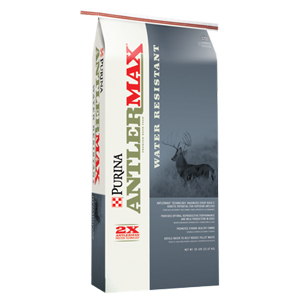 ANTLERMAX® WATERSHIELD DEER 20 FEED is a researched 20% protein ration. Specifically formulated for what free range deer require to support overall health, reproductive performance and antler growth.